A park, a wall and plastic covered ground to stop vegetation from growing. The Tamagawa Josui (more about it here and here) is a 43 km waterway built to supply Edo (now Tokyo) with water, work started in 1653. Along a section of the Tamagawa Josui in Suginami-ku a road is being built, as all road developments in urban areas, things are in the way of the planned road. A comment in Japanese about the development here and a blog about here. The situation regarding the execution of theese planned road that often stretch far back in history is more complicated than I've previously realised. There are literally thousands of such plan, particularly for City Planning Roads (Toshi keikau doro) projects for multilane arterial roads through existing urban areas. ... Although it might seem a simple matter for the central government to cancel a plan that is no longer needed or wanted (...) in fact it is not so easy to cancel such plans. ... - [As the plan] put some legal restrictions on allowable building activity, the government is concerned that cancellations of plans that were approved in the 1960s and 1970s might prompt massive compensation claims from affected landowners. No city planning roads have yet been cancelled. André Sorensen and Carolin Funck in Living Cities in Japan , Conclusions: a diversity of machizukuri processes and outcomes. The road project I've previously written about change a bit in the light of the above quote. The fantastic pocket of time here in special, but also here and here. The projected road development along the Tamagawa Josui is well underway but the physical reality during the years long implementation of the plan is just strange and sad. A section of the plan. An Urban Farm along the Tamagawa Josui. Here you buy your locally produced vegetables, just leave some coins corresponding to amount you take with you. There are many small patches inside the urban areas of Tokyo still working as farms. This is the advantage of urban development happening in small chunks. Today these farms are seen as resource by the city. A video rental store (they still exist in Japan), proclaiming its existence towards the street. The fake facade isn't used for the sign of the store, but to fit in the urban context. A peculiar decorated shed. Nagakin Capsule Tower. Kisho Kurokawa. This now rundown building is the realised key building of the metabolist project, a dream of handling the explosive growth of Tokyo and other cities (look here). The capsule were the cells of the metabolist city, movable functional living units. No capsule has ever been moved on this tower. This building should be seen as an alternative dream future that never happened. As many utopian futures there are many problems to address. the political goal of metabolist urban planning could only have meant the erasure of private land ownership and its total re-organization. Imagining the organic city p. 172 - M. Schalk. The idea lives on in the capsule hotels which can be found around major train stations in Japan. But there the capsules fills interior space instead of defining the exterior as here. Also individual movable homes, capable of creating informal cities of course exists, but are mostly ignored because they are the homes of the poor. The competition for the new structure above the grand pier in Yokohama was won by Foreign Office Architects 2002. An organically  shaped wooden landscape with patches of grass undulation and sliding between the different levels. [FOAs] Yokohama Ferry Terminal saw them burst on to the international scene with an extraordinary structure which blended infrastructure, engineering, architecture and landscape to create a new typology for transport. A series of entrance situations of house on plots of flagpole type. Variation in material, usage and other things. Entrance floor of Tama Art University Library by Toyo Ito. This is a fantastic building. Restrained and calm. Irregularly space concrete vaults divides space along curved lines. More to read from Dezeen here and on Archdaily here. 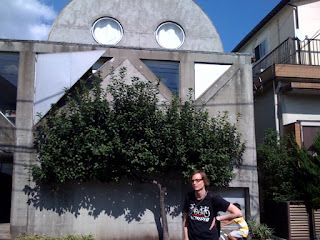 A tour guide in front of House in Uehara, Kazuo Shinohara. If you want to join please email, tweet or leave a comment. More about tours and complete schedule here. Fuji Kindergarten, Tezuka Architects, 2007. Slide from roof. Located far out in suburbia this kindergarten has simple policy. Kids first. Help me Do It Myself. The Montessori philosophy is clearly visible in both building and staff. This kindergarten has been selected as the best education building in the world. This project makes me warm and happy. Kengo Kuma, M2, 1991. Originally built as a showroom for Mazda. The fallen temple architecture of collapse, the Ionic column, curtain wall facade; the combination of elements: post modern architecture to the max. This building is completed at the end of the this style of post modern architecture. After this building and one more near Gaienmae station (much more discrete), Kengo Kuma changes style and interests in Architecture. I like this building on it own. But also within the context of the time it was produced in and since it shows that changes of style are possible. Somehow Japanese architecture is always contemporary. Can you spot the plants? The boring hedges along Nakano-dori are being infiltrated. A bicycle lane in Setagaya-ku. An update from an earlier post today about bicycle lanes. Note the cigarette butts in the curb. Curbs are were garbage ends up. The limits of the super block defining the so called Urban Villages, even tough they are not always villages in themselves in function. But Tokyo is a city of functional villages, but they doesn't overlap with the Urban Village definition. Functional in the form of small communites within walking or cycling distance from a train station. Of course in the city center and further out this simple model falls apart, it also not true for all train lines, however it is the ideal of Tokyo in example the Tokyo Fiber City 2050 plan ( - in my opinion, very interesting research). High buildings along a a larger road, low building between roads. At the top a wall of buildings along another road. This is defining morphology for Tokyo to large extent. However the larger roads are only one of a number of networks useful to orient oneself in the city. Sumida Culture Factory, Itsuko Hasegawa, 1994. Exhibition space, library, planetarium, restaurant and multipurpose hall. Itsuko Hasegawa is the first famous female architect in Japan, she is contemporary with Toyo Ito (both born 1941) in many ways. Her career however is shorter, and today less notable. This building as well as its contemporary projects eventually leading up to the master piece of the style Sendai Mediateque by Toyo Ito. She worked as the assistant of Kazuo Shinohara at Tokyo Institute of Technology. Shinohara also deeply influenced the work of among others Toyo Ito with whom Kazuyo Sejima of SAANA worked before she started her own firm. (For more of this kind of genealogy see After the Crash: Architecture in Post-Bubble Japan by Thomas Daniell, an excellent collection of essays about Japanese architecture.) This isn't just gossip but it also provides a framework for understanding the contemporary context of a building. When I visited it, woefully unprepared, suddenly a lot of things came together. The history of architecture suddenly seemed a little bit more clear. This is partly why I choose this building but for the most part it is because I like it. This isn't a space ship. 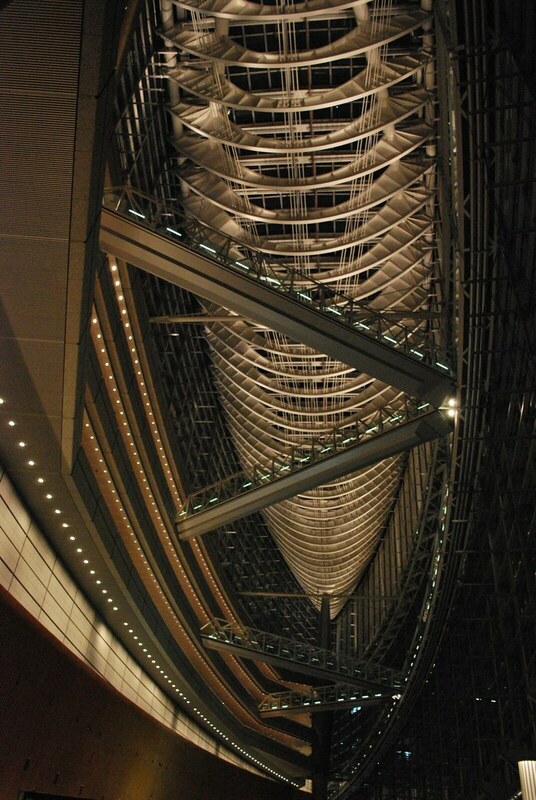 It is the Glass Hall, the grand space, of Tokyo International Forum, Rafael Viñoly, 1996. A congress center located next to the Yamanote and Tokaidao lines just south of Tokyo station. Saitama Prefecture Univsersity, Riken Yamamoto, 1999. Entrance along ramp. Roof marking entrance. This projects consists of the entire university campus consisting of 54000m2 of a small university dealing with nursing and welfare. It is a strong systematic composition broken into smaller parts by handling of circulation spaces and void space. It creates complexity out of a series of parts by virtue of how it handles them. This is varied uniformity. The building is empty because of spring break. Kenzo Tange, 1964. An impressive concrete shell structure provides an sublime space. That [Yoyogi National Gymnasium] and St. Mary's Cathedral in Bunkyo Ward — which is also by Tange — are probably the two best buildings in Tokyo. 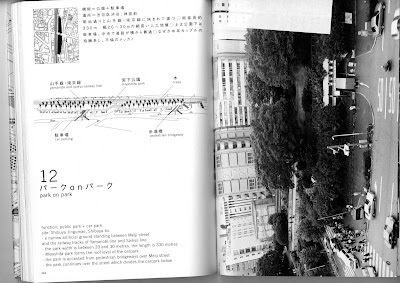 Kengo Kuma, Interview in Japan Times here, Oct 2010. Kenzo Tange is arguably the premier Japanese architect from the last 20th century. This is a list of buildings worth seeing in Tokyo. It shouldn't be used as list of buildings that should be seen on a short trip to Tokyo. There are other building and places worth visiting. This is a list of the buildings that I've visited that has impacted me the most; this is not a statement indicating that the buildings in any way are the best pieces of Architecture in Tokyo, or even the best by the respective architects featured in this list. Some of them aren't even in Tokyo (but always in the greater Tokyo area), and two of the high quality architecture areas in Tokyo has been omitted to simplify the process: Ginza and Ometosando. Also limitations of scale apply, it is a list of buildings not houses as such things are understood in Japan. But seeing the buildings featured in the coming posts have somehow opened up my eyes for the variety found in Japanese architecture. Happy new year! And welcome to a bit late schedule for January. So why would want to join in on this tours? This is what Jared Braiterman from Tokyo Green Space thinks. Jan 8, Sat. Setagaya cycling tour. Cost ￥2000 or ￥1000 for students. Starting point, Segafredo next to Nakameguro station (Google map), 11:00, about 3h. Projects by Kunio Maekawa, Sejima, Kengo Kuma, Atelier Bow-Wow. Some roads. Morphology. Mostly cloudy, 11 degrees. Jan 15, Sat. Meguro Cost ￥2000 or ￥1000 for students (Google map). Starting point, next to Segafredo, Nakameguro station. Explore the architecture in dense areas in the wooden belt of small scale houses. Jan 22, Sat. Suginami Cost ￥2000 or ￥1000 for students. Starting point, Opera City corner of Koshu Kaido and Yamatedori. For details see review above. Jan 29, Sat. Komaba 11:00. Approx 2:30. Cost is ￥1000 or ￥500 for students. Starting point, McDonalds next to Komaba-Todaimae station (Google map). Architecture: Shigeru Ban, Kazuo Shinohara, Hiroshi Hara etc. City: River roads, road development, morphology, history (similar to here). More details at the Tour page. If you want join send me an email.